They say that if you give a person a fish, she’ll eat for a day. But if you teach her how to fish, she’ll eat for a lifetime. But the creator of this idiom overlooked a critical question: how do you get someone to want to fish in the first place? When we design social services at JDC Israel – and in our general understanding of each other as human beings – we assume both ourselves and our peers to be rational. But as however many years of being a person may have taught you, that is rarely true. Sure, you should be saving for your retirement, but you like eating out for lunch every day. Of course you know that carpooling makes it cheaper for you to get to work every day (not to mention the impact of the environment), but who’s got the time to arrange all of that? No matter how much information we might have, there’s still a chance we won’t make the right decision. The study of our own irrationality is called Behavioral Economics. 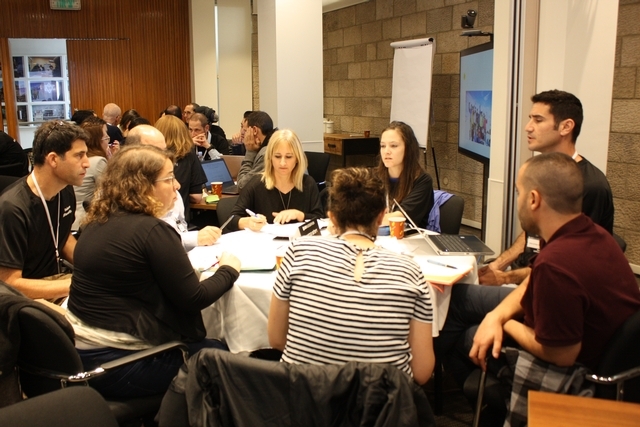 And, thanks to Professors Dan Ariely and Michal Grinstein-Weiss, we held the first-ever social impact Nudgeathon at JDC Israel last week to make sure JDC Israel’s critical programs factor in the inherent irrationality of human decision making. So what is a Nudgeathon, anyway? Often, when we want to change people’s behavior, we use two primary strategies: rules (with punishments if you break them) and rewards (that are large enough to encourage a certain outcome). Both of these options assume that every choice is a cost-benefit analysis of what we have to gain or lose. But what about in those split-second, subconscious moments of decision-making? What about the emotional triggers that push us one way or another? Interventions that control for those factors – small changes that make a big difference – are called nudges. One example of a real world application is making organ donation something you have to opt-out of instead of opt-in to – research shows you’re more likely to do something if you feel like it’s a norm. A Nudgeathon uses these principles of behavioral economics and, just like a Hackathon, convenes a group of people to spend time building nudges that can make a huge difference in society. Dan Ariely brought in behavioral economics experts from universities across Israel to incorporate nudges into JDC’s own programs. One program that deals with children’s health was having trouble recruiting parents to participate, even though the ones who did gave it rave reviews. What was the disconnect? Though the program was worth 1000 shekels, we were offering it for only 50, which signaled to some participants that it might be a low-quality program – you get what you pay for, right? The nudge we created was to share the actual price with prospective families and offer it to them at the discounted rate. That way they’d know the true value of the program and feel more inclined to participate. Another program was built to teach young people how to spot sexual violence and interfere when the time is right. Researchers found that people don’t intervene because they feel social backlash. Our nudge was “rebranding” standing up against sexual violence by giving people the tools to be a “guardian angel.” On weekend nights, when we know people are going out, a text message will be sent to participating “guardian angels” with behaviors to look out for and a badge they can place on social media showing people that they can be allies in their time of need.